Ariana Resources plc is an AIM-listed gold-silver exploration and development company with operations in Turkey. It has a proven strategy of identifying and developing mineral resources and advancing them to production through joint ventures. 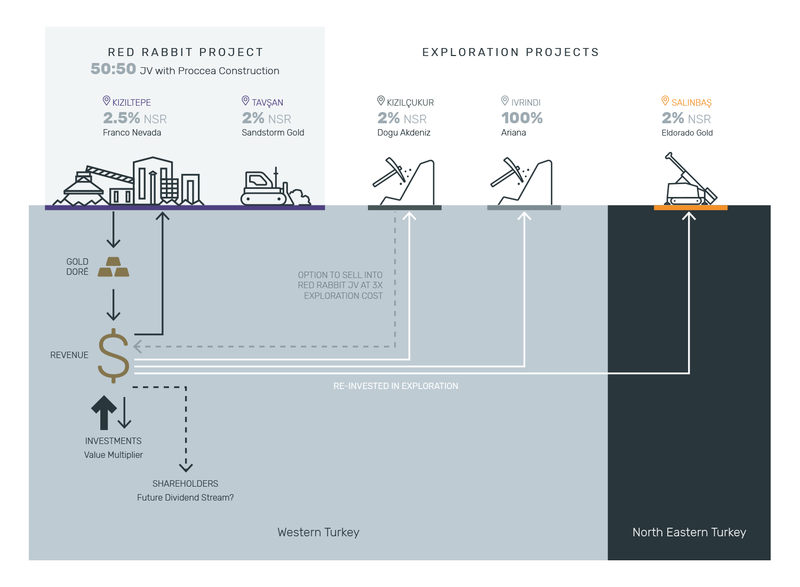 Commercial gold-silver production commenced in July 2017 at our Kiziltepe Mine which forms part of the Company’s wider Red Rabbit Gold Project in joint venture with Proccea Construction Co. There is significant opportunity for further resource and production expansion within this joint venture. Our strategy will expand our portfolio of projects by utilising current cash-flow to identify new gold deposits and develop profitable mines. The Company is currently exploring and developing the 1 million ounce Salinbas Gold Project in north-eastern Turkey which demonstrates substantial exploration upside. The project is located within the highly-prospective Hot Gold Corridor, which includes the 4 million ounce Hot Maden project located just 16km south of Salinbas. In addition to its proven expertise in gold exploration, mine development and production, Ariana maintains a longer-term strategic interest in commodities with applications in the renewable-energy sector and has been successful in creating significant value through investments via its wholly-owned Australian subsidiary, Asgard Metals. Turkey represents a unique opportunity for gold exploration in Europe. Turkey lies within the globally significant Tethyan Metallogenic Belt, which hosts some of the world’s largest gold, copper and silver deposits. The country is Europe’s major gold producer, with 15 operating gold mines established within the past 17 years. We are advancing our strategy on other mineral project opportunities in Turkey and its surrounding region and globally through Asgard Metals. Our strategy is to achieve sustainable long-term growth of the Company through robust and cost-efficient gold exploration, development and production. Our superior utilisation of technologies has allowed us to identify, advance and develop projects rapidly, at a discovery cost less than half that of our peers.